Yes, you are looking at a 2-iron! And no, this is not the History Channel. These things are just about obsolete these days (which is why you can buy one for only $30.) The 2 iron has gone the way of the type writer, the Betamax videocassette, and MC Hammer's Pants! Why, you ask? Well, the advent of the hybrid club. DUH! But since you are looking at this 2-iron, I'll give you a quick rundown of the specs before I point you in a better direction. The Nike Slingshot 2 Iron w/ Rifle Shaft RH Stiff Flex features a Precision Rifle steel shaft and a Golf Pride Tour Wrap grip. These are high end qualities for such an inexpensive club. This is a genuine, well-crafted Nike golf club which (before hybrids came along) would probably sell for $100. So if you really want a 2-iron, go ahead and indulge. At this price, you might want to buy a dozen of them. However, if you are like the rest of us, please take a look at some of these hybrid clubs. For the scratch to low handicappers, take a look at the TaylorMade Rescue TP Hybrid that Y.E. Yang hit brilliantly on the last hole of the PGA Championship to beat Tiger Woods. If you are an average golfer, please look at the MacGregor Golf MT Hybrid Utility Club. 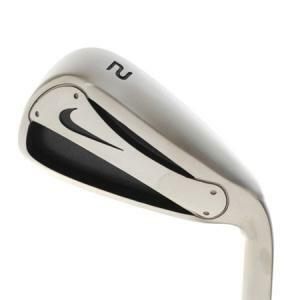 Finally, you should only buy this 2-iron for the back seat of your car to be used in extreme cases of road rage like Jack Nicholson. Remember? Back in 1994, Jack brandished a golf club after being cut off in traffic. He confessed to Golf Digest, "… I reached into my trunk and specifically selected a club I never used on the course: my 2-iron."